Oh, so this is the world? due vowels with rounding mouths. lost to the flood until everything is the horizon. moving through the body’s hull. will be the stillness of water’s fine lie. and fathered two sons. But you have a brother! final night when you spoke slowly as morphine’s drip. was a father, despite such an unlikelihood. you told people your dad was dead, few believed you. mirrors for looking into. Only you remain. And yet. All poems reprinted from How to Prove a Theory (Washington Writers Publishing House, 2017), with permission from the author. An earlier version of “Gentle Obsessions” appeared in Rust + Moth, Autumn 2014 issue. Washington Writers Publishing House is a non-profit organization that has published over 50 volumes of poetry since 1973 and nearly a dozen volumes of fiction. The press sponsors an annual competition for writers living in the Washington-Baltimore area. WWPH is a cooperative, and winners of the annual competition become members of the collective, working on publicity, distribution, production and fundraising to continue the vitality and success of the press. 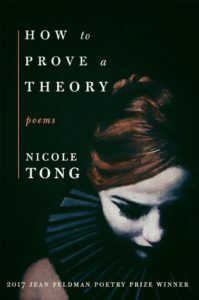 Nicole Tong is the author of How to Prove a Theory (Washington Writers Publishing House, 2017), winner of the Jean Feldman Poetry Prize. She is the recipient of fellowships from the Vermont Studio Center, the Virginia Center for the Creative Arts, and George Mason University, where she received her MFA. In 2016, she served an the inaugural writer-in-residence at Pope-Leighey House, a Frank Lloyd Wright property in Alexandria, VA. She is a recipient of the President's Sabbatical from Northern Virginia Community College, where she is a Professor of English. Her writing has appeared in American Book Review, Calyx, Cortland Review, and Yalobusha Review.